Merry christmas! I wanted to share some pictures from my awesome Christmas tree because this year I decided I wanted a Nightmare Before Christmas themed Christmas! I have this terrible cold this week, so I'm happy I already decorated the tree early in December. 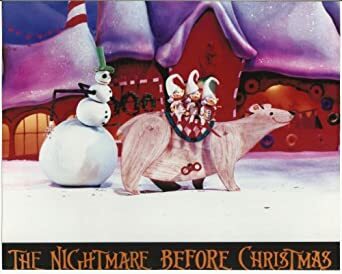 ​I have a couple of all time favourite Christmas movies (a lot, actually), but The Nightmare Before Christmas tops that list hands down. It's wonderfully weird and creepy and funny and the soundtrack is just amazing. The hard work that went into this film is so evident when you watch it. This movie also never ever gets old, no matter how often I've seen it. And I watch it at least every Halloween and then again at Christmas, ever since I was a kid! By the way: this year I discovered there's actually a Nightmare Before Christmas videogame (for the original Xbox, haha), so I bought Oogie's Revenge as an early Christmas present to myself :P. You play as Jack, and you have to do these missions and fight off evil skeletons and ghosts. Hilarious! We went to a place called Gerrit's Kerstbomenland (Gerrit's Christmas tree land) and it was a magical place, haha. They had the best selection of trees I have yet encountered. Then we fell in love with this tree here. We loved it so much, we didn't pay much attention to the size of it. We should've known, because it was a little bit harder than usual to carry the tree. 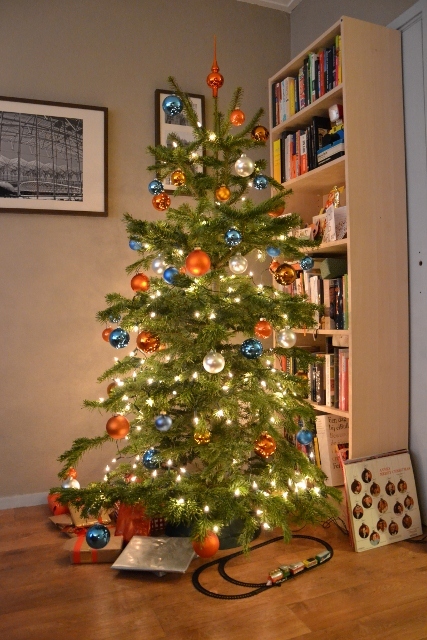 We only truly noticed its size when we unpacked the tree at home and saw how much space it took up in our living room. Hahaha. Oh well! It's the best tree we've ever had. It makes all the trees of Christmas past seem sad. I nabbed all these cool Nightmare Before Christmas figurines from eBay months ago. Santa Jack! I think I love these elfs and bear the most! They're from the "What's This?" scene (together with Snowman Jack)<3. I love this one as well! Dr Finkelstein! The wheels actually move, freaking awesome. I bought a bunch of cheap white glass baubles at a discount store, and drew Jack Skellingtons on them with a plain marker. We went to the Disney store in Milan and bought a set of Nightmare Before Christmas baubles. They're made of plastic, which I hate, but they're nice to have anyway. I filled the rest of the tree with mostly black and purple baubles, black stars and black tinsel. For Halloween I drew Jack on our chalkboard, and then transformed him into Santa Jack in December. I also drew the countdown clock from the movie. Only 2 more days people! I'm also going to make these Spiderflakes (if I ever get better) to complement the paper snowflakes that are now hanging in front of the window. If I have some time left maybe I will try to do some of this stuff here as well. ​So there you have it, my Nightmare Before Christmas themed Christmas tree :) I'm pretty happy with the result. Hope you guys have a wonderful Christmas with all your loved ones!